Home | Maggie and Grace Raise Funds to Perform in the West End! Our students have been busy preparing for our trip to the West End in June 2019, where we will be treading the boards of Her Majesty’s Theatre (home of Phantom of the Opera) with our very own musical “Trouble’s A Brewin’”! Some of our students have been going above and beyond with their entrepreneurial efforts. 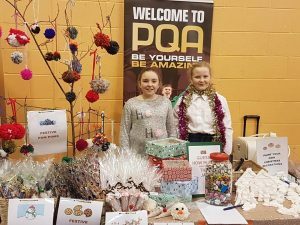 Here we have two of our Blue Group students, Maggie and Grace, to tell you all about their fundraising efforts! Hello! I’m Grace and I’m Maggie, and we are both in Blue Group at PQA Llandudno. We would like to talk to you about how we have raised money to go to the West End in London. In the end we made a whopping £126.44 !!! So we each got £63.22 . When we got to PQA, we sold our leftovers and made an extra £2.00. We added this on to get £65.22 each! We would like to thank Principal April for letting us do this report. We are so excited to be performing “Trouble’s A Brewin’” in London this year! Lucy Goes to London: Trouble’s A Viewin’! Maggie and Grace raise funds to perform in the West End, London!